Plymothian Transit: Olympian Swan Song? 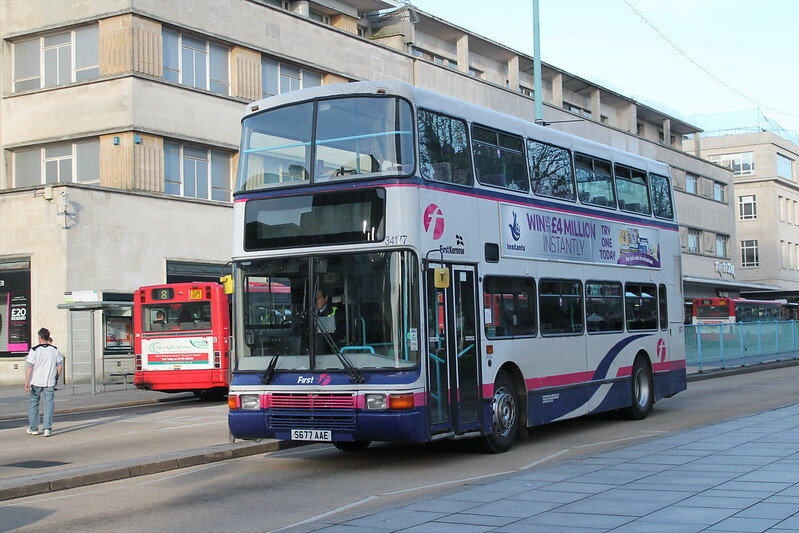 With the influx of Tridents into the First Devon & Cornwall fleet in Plymouth the Volvo / Leyland Olympian has all but disappeared from our streets but this rather scruffy Volvo was noted a few days ago (8th March) by Richard Smith. Shortly after this photo was taken it left Royal Parade on the 15. I can only assume it was a rare working as I haven't seen it on the 15 since, and I do get to see most of the 15s each day. Its pretty much all day Tridents these days. As you say though, Tridents do appear frequently on the 15 nowadays, with near enough every 15 I've seen in recent weeks being operated by a Trident. Looks like an old clapped out bus First have brought up from Cornwall .. hopefully temporarily. It has to be said most of the fleet in Plymouth is better than this nowadays, since we got rid of our rubbish to Dorset! I see it has First Kernow branding, so presumably on loan to Plymouth. The Olympian is very alive and well in Cornwall! if you look you can see the cornish ticket machine which is different to the one's we use up here, it was probably up here and they borrowed it for service, on average we are 5-6 buses short every day!